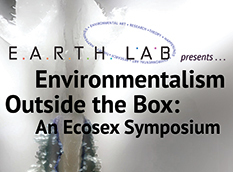 This 2-day public symposium, hosted by the E.A.R.T.H. Lab, an Arts Division center at UC Santa Cruz, will explore how and where environmentalism intersects with race, class, and sexuality within current systems of neoliberalism. The event aims to foster discussion, develop philosophies, and discover new ways of working with the hope of encouraging horizontal cross-pollination between artists, philosophers, critics, sexologists, scientists, activists, permaculturists, students, and others.